Location: No.91, East Xiaozhai Road, Xi'an City, Shaanxi Province. 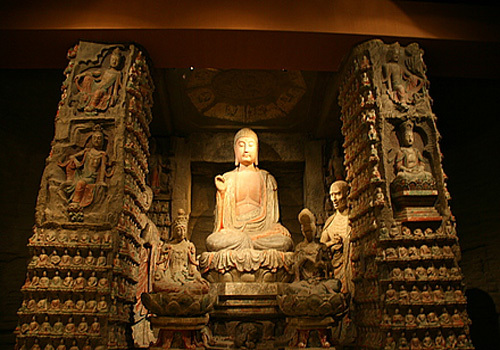 Located northwest to the Big Wild Goose Pagoda, Shaanxi History Museum, or Shaanxi Provincial Museum, was completed and opened to the public in June of 1991. As the capital of 13 imperial dynasties in Chinese history, Xi'an is endowed with rich treasures in both culture and substance. 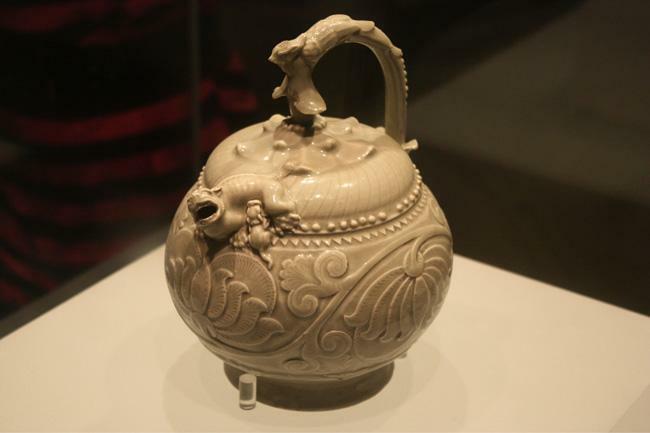 Thanks to that, Shaanxi History Museum, the first large-scaled modern national museum of China, got the chance to preserve a great number of the historic and cultural relics. 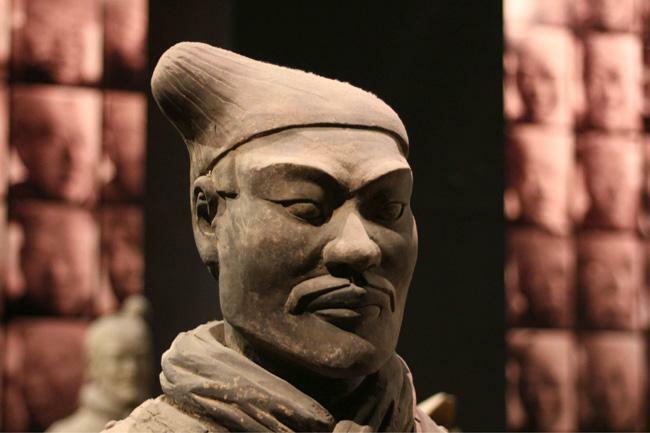 The Shaanxi History Museum is made up of an architectural complex of Tang style – white walls, dark grey tiles and pyramidal roofs – with the main building at the center and the others arranged around it. Occupying some 65,000 square meters, the museum keeps more than 370,000 pieces of historic and cultural articles, ranging from the simple stone tools used by primitive human over a million years ago, to all kinds of objects used in the 19th century. 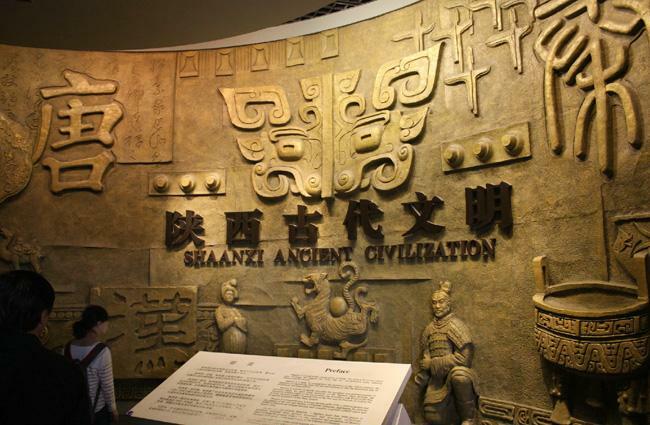 The subject of "Ancient Civilization of Shaanxi" became the permanent exhibition of the museum since March of 2008. 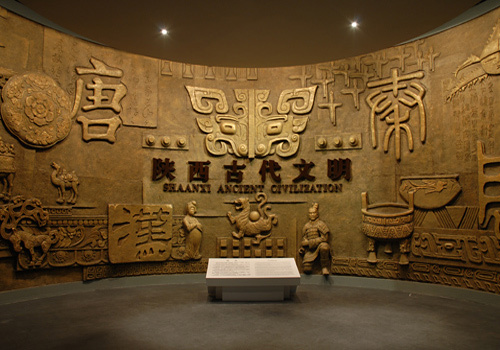 This 5052-square-meter area is divided into 3 halls with 7 units, telling the history and development of the province as well as its contribution to Chinese civilization. Unit 1: From Ape to Man. It introduces the Homo erectus lantianensis (1.1-1.15 million years ago), the homo spiens Daliensis (0.15-0.2 million years ago), the relics of Banpo and Lintong Jiangzhai matriarchy (about 6000 years ago). Unit 2: The Phoenix Sing on the Qishan Mountain. 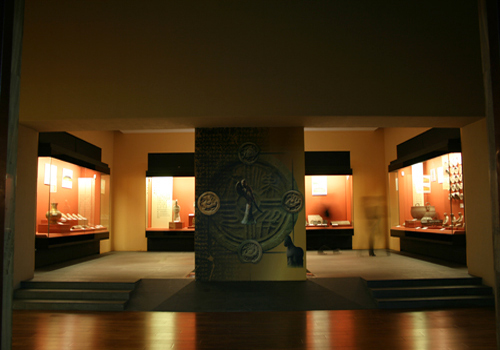 This unit shows the national political system, economic form, moral principles and casting techniques of bronze of Shaanxi when it was the capital of the Western Zhou Dynasty (1076BC-771BC). Unit 3: The Oriental Empire. 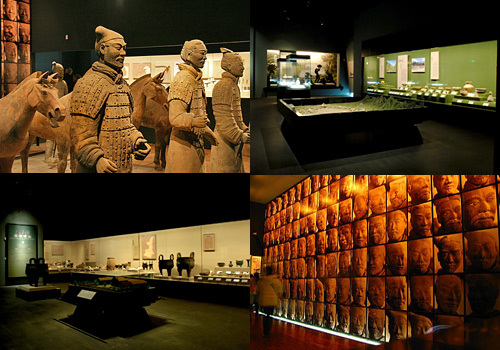 Abundant historic remains with the Terracotta Army and Horses being the most outstanding are displayed here, re-presenting the powerful but short-lived Qin Dynasty (221BC-206BC) ruled by Emperor Qin Shi Huang (256BC-210BC). 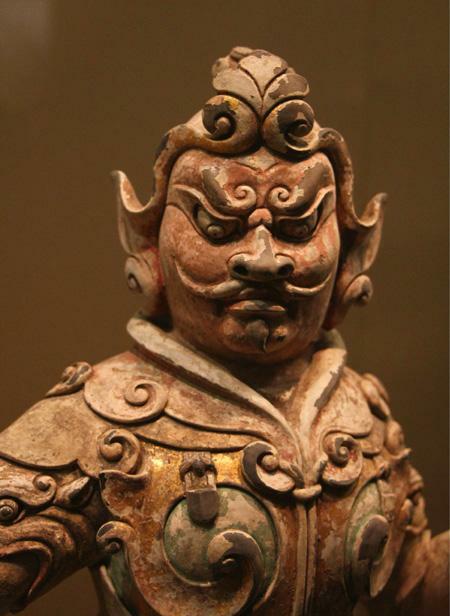 Unit 4: The Flourishing Western Han Dynasty. The look of ancient Chang'an (Xi'an) as the capital, the imperial mausoleums and the typical articles of the dynasty can be seen in this unit, including its boom in economy, culture, diplomatic communication, etc. Unit 5: Conflict and Amalgamation. 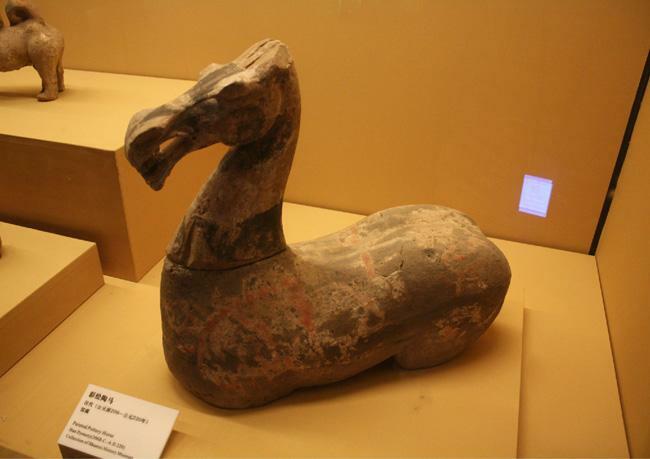 It unfolds the cultural relics and articles of the agricultural and nomadic ethnic groups of Shaanxi as well as Buddhism's spread eastwards and arts' development in ancient China. Unit 7: Farewell to the Imperial Capital. It states how Chang'an (Xi'an) continued to develop after it lost the position as a imperial capital after Tang Dynasty. 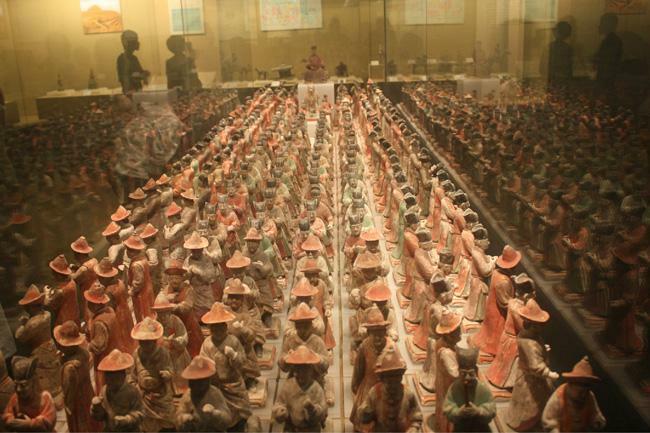 In addition, there are over 600 pieces of historic articles which are carefully selected are exhibited in the Shaanxi Bronze Wares and Terracotta Figurines Exhibition Halls. 1. 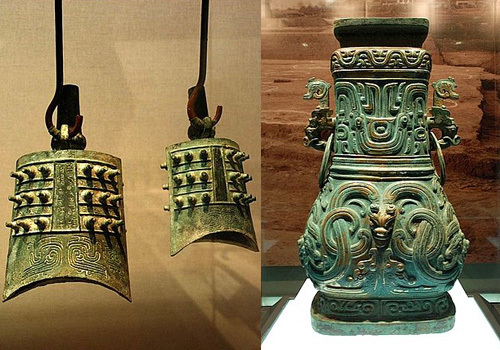 Bronze wares: Over 3900 pieces of thousand-year-old bronze wares containing sacrificial vessels, musical instruments, weapons, decorations of wagons, articles for daily use, and means of production are revealed in the museum. 2. 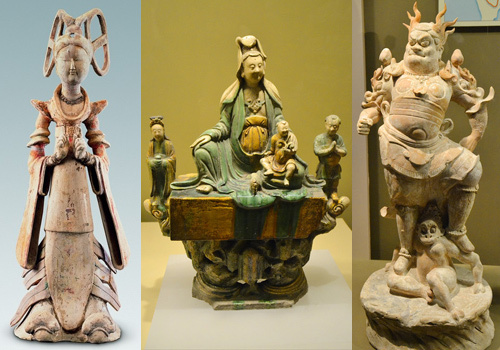 Terracotta figurines: These Collections of unvarnished pottery, color-decorated pottery, glazed pottery and three-color glazed pottery include statues of imperial bodyguard, officials, servants, gods, beasts, horses, camels, etc., which were respectively made in Qin Dynasty, Han Dynasty, Northern Dynasty, Sui Dynasty, Tang Dynasty, Song Dynasty, Yuan Dynasty, Ming Dynasty and Qing Dynasty. 3. 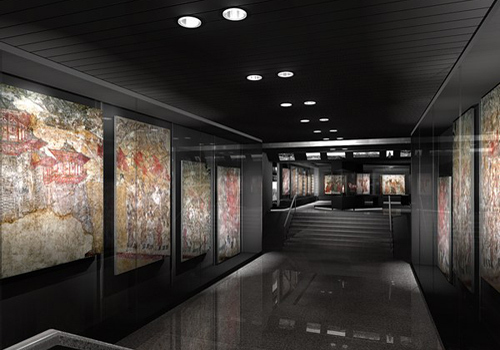 Hall of murals of Tang mausoleums: A modern mural exhibition hall was constructed to store the over 400 murals uncovered from 25 mausoleums of Tang Dynasty, totaling some 1000 square meters. All of the mausoleums belong to the members of the royal family and important ministers, hence the murals is of great richness and gorgeousness. The genuines are exhibited to visitors on some time weekly. 4. Building materials: The ancient building materials involve figuline tiles, eaves tiles, bricks, water channels, carved stone, metal materials, and so on, with the oldest traced back to 3000 years ago. 5. 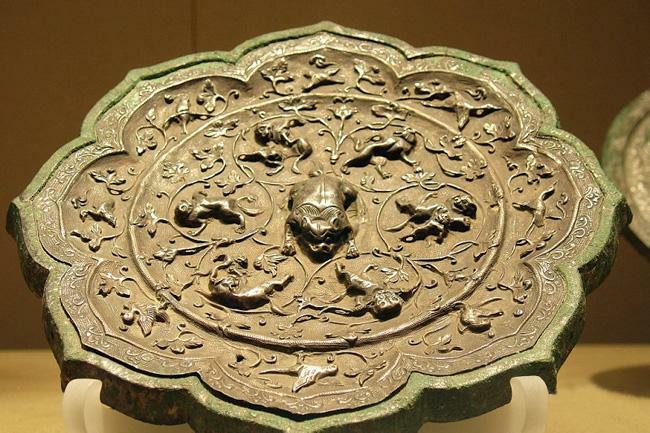 Bronze mirror of Han and Tang: Visitors can see more than 800 exquisite ancient Chinese bronze mirrors made in two of the most prosperous Chinese dynasties. 6. 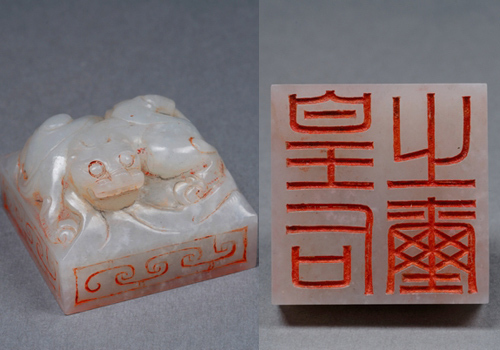 Gold, silver and jade wares: The quantity exceeds 2000 pieces, e.g. the sacrificial vessels of Western Zhou Dynasty, woodpecker, sandalwood burner, and agate cups from royal mausoleums, etc. 7. Currencies: There are various ancient Chinese currencies, 10,000 registered ones and 50,000 unregistered ones, 7000 kilograms in total, including the old shells, knife-shaped metal coins, foreign coins, etc. 8. Others: scripts and paintings, Scriptures, fabrics, bone objects, carpentry, lacquerwares, ironwares, stone implements, seals, an so on. Opening time: from Tuesday to Sunday and on national legal holidays (closed on every Monday and the Eve of Spring Festival for regular examination), 08:30-18:00 from March 16th to November 14th, 09:00-17:30 from November 15th to March 15th. Ticket information: the museum issues 4000 tickets for free every opening day (2500 before 14:00 and 1500 in the afternoon), visitors can get the tickets by showing their ID cards or other valid certificates. One can get a ticket only and the tickets are valid only on the day they are issued. An appointment should be made 24 hours in advance for group visit. How to get there: take buses No.5, 19, 24, 26, 27, 30, 34, 400, 401, 521, 527, 610, 701 or 710 and get off at the stop of Cui Hua Lu (翠华路, Cuihua Road). 1. Visitors can put their parcels in the checkroom of the museum for free, but it is suggested to take the valuables along. 2. 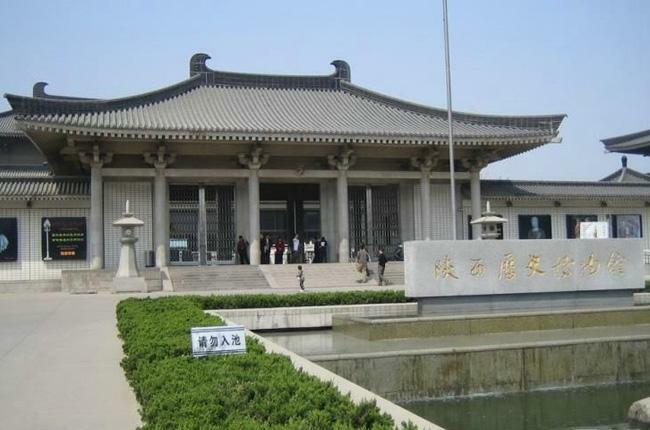 People dress sloppily or behave in a rude manner are not allowed to enter the Shaanxi Provincial museum. 3. 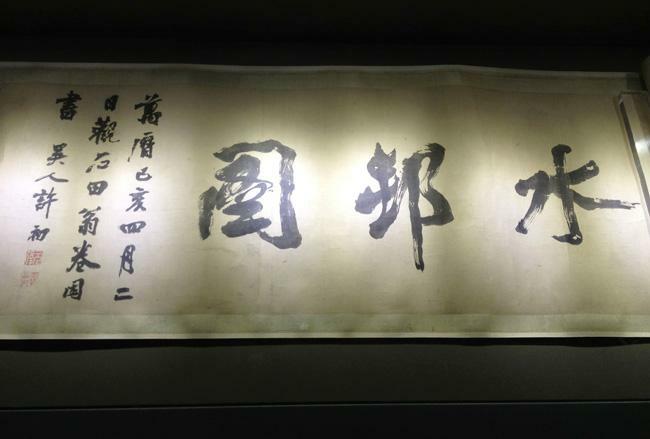 Food, drinks, pets and hazardous articles are prohibited to bring to the Shaanxi Provincial museum. 4. English-speaking and Japanese-speaking tour guides and English, French, Japanese and Korean audio guides are available in the museum. 5. 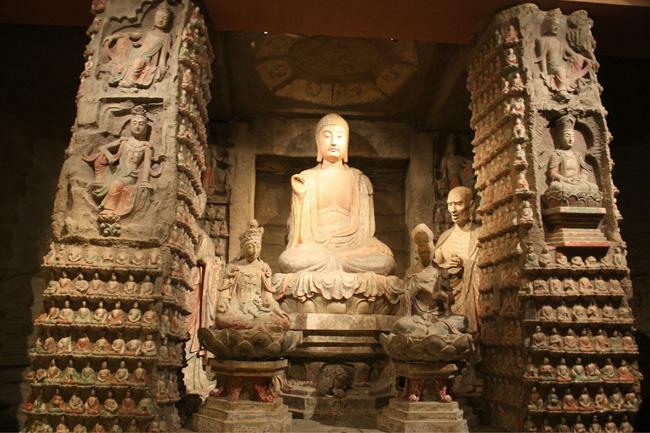 Please keep as quiet as possible and stay away from the bare exhibits in the Shaanxi Provincial museum. 6. To protect the exhibits, please take photos without flash lamp. 7. There are benches in the Shaanxi Provincial museum for visitors to rest; or visitors can stop at the shop and the teahouse inside. 8. Frequently-used first-aid drugs are provided for free. Besides, visitors can use baby carriages, wheel chairs, walking sticks, umbrellas and visit the electronic reading room for free.